I need to replace my loud "turbo-style" muffler with something much quieter. 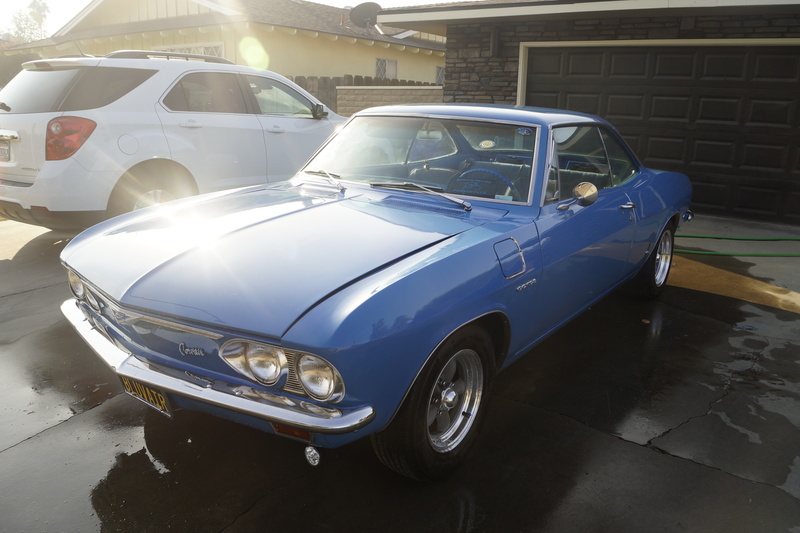 The LM Corvair Turbo is hard to fit anyway, and my wife is tired of the neighbors getting an earful every time I leave the garage. I love her and the car about equally, but I can't put the "Bluvair" in my bedroom, so I need options. Preferably one that will fit, work well, and whisper. I figured if anyone would know it'd be this crowd. Help a brother out. Edited 1 time(s). Last edit at 04/14/2019 07:10PM by MattNall. Find a stock one ?? Clark's shows NOS, C13X, and repro, C14R. What muffler is on it now? For stock LM, the numbers are C14 (NOS) and C14R (reproduction). I do think stock will be as quiet as you can get. 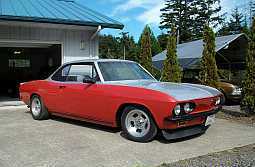 I've never considered any stock Corvair exhaust to be loud. Have the neighbors ever actually said anything? I know, we all want to keep our wives happy. Just wondering if they said something or what makes her think they are displeased. Edited 1 time(s). Last edit at 04/11/2019 11:50AM by Spectre. > Clark's shows NOS, C13X, and repro, C14R. Yup. Quietest you'll get is a stock replacement. 66 Corsa Convertible, 140, 4sp. 65 Monza Convertible, 110, PG. It doesn't leak, it's marking it's territory. A mirror is a reflection of the miles travelled. 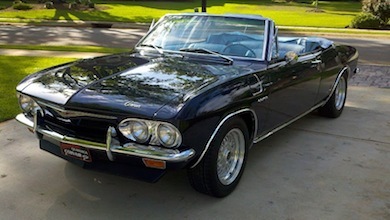 CA Corvair also has exact reproduction...way less shipping cost. I have a data point for you: my 66 has an early style turbo muffler and my 65 has the correct later style as described above. The later 65-66 muffler is significantly quieter than the early style on my 66. Just know that, depending on what you have now, you may need a new down pipe, muffler, tailpipe, and hanger. Show us a picture of your current setup. I have a NOS 66 Turbo muffler sitting in my storeroom that I don't need. The part number I have is 3869877. Second design turbo muffler according to parts book. My neighbors haven't SAID anything, but my lady is the type to project and worry about that stuff before the fact. I was told by someone who saw it (Mike Deklotz of Mike's Corvair Parts) that it looked like an early turbo muffler, but I got it from the stock on hand at a local muffler shop. He did identify it as "turbo" at the time. Here's a picture of my setup. Al, I will PM you about your muffler. I agree. If you can get a pipe to extend the end of the muffler outlet to just past the body, there should be a difference in sound. Right now you're probably getting surround sound in your cabin! And that is not a Turbo Muffler... too long??? Remember.. the quieter you get the more restriction... less boost. Never thought about that placement. I'm sure it's causing it to resonate around the street through a cone effect too. I know more quiet means less boost, but ... the price of peace! 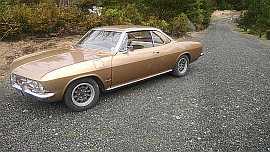 According to something I just read recently (Performance Corvairs?maybe? ), Chevrolet tested all kinds of configurations and concluded that the perfect tail-pipe length for the turbo engine was 9 INCHES long! any longer, OR shorter and it got louder! 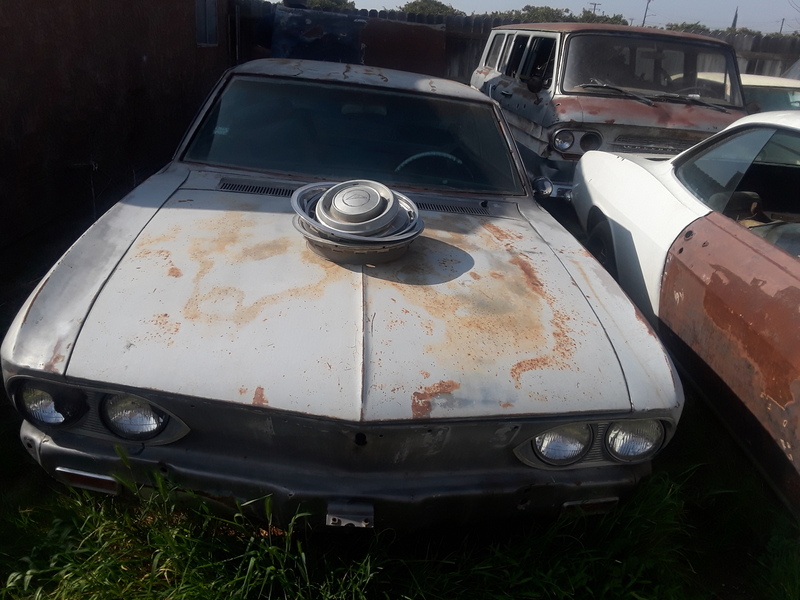 I think anyone with any Corvair parts experience can easily see that muffler is too thin to be a Corvair turbo muffler. The big 2+ inch outlet pipe is nearly as fat as the body of the muffler itself. Like the other keen observers said, the tail pipe is far too short also. Get the correct factory muffler and long chrome tailpipe and your wife, your neighbors and you will be happy! The length of the tail pipe is Vairy critical, GM discovered they could use a much less restrictive muffler just by adjusting the length of the pipe. Quieter does NOT have to equate to less boost. The second design 65 stock muffler is as quiet as it gets, and very low restriction. Thus the reason the thing is as big as a trash can (its nickname in the 60's). The muffler you have is bound to be loud, no matter how long the tailpipe is. 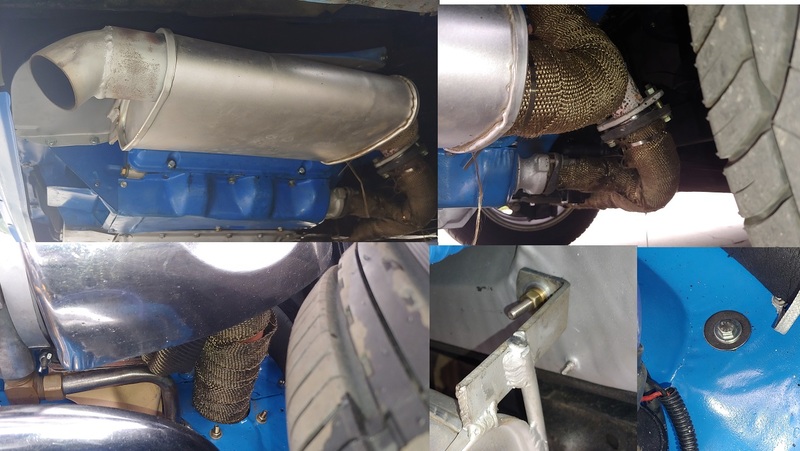 By the way, wrapping the pipe after the turbo does not help performance, only the turbo upstream piping, so if you change the muffler and downpipe, don't worry about replicating that. After you install a second design stock exhaust, maybe you could sell that muffler to one of us who don't care what the neighbors think! I have a new inbox 14r I would love to sell.